Before you can assign, monitor, configure, or protect apps, you must add them to Intune. One of the available app types is Office 365 apps for Windows 10 devices. By selecting this app type in Intune, you can assign and install Office 365 apps to devices you manage that run Windows 10. You can also assign and install apps for the Microsoft Project Online desktop client and Microsoft Visio Online Plan 2, if you own licenses for them. The available Office 365 apps are displayed as a single entry in the list of apps in the Intune console within Azure. You must use Office 365 ProPlus licenses to activate Office 365 ProPlus apps deployed through Microsoft Intune. Currently, Office 365 Business edition is not supported by Intune. If there are .msi Office apps on the end-user device, you must use the Remove MSI feature to safely uninstall these apps. Otherwise, the Intune delivered Office 365 apps will fail to install. Devices to which you deploy these apps must be running the Windows 10 Creators Update or later. 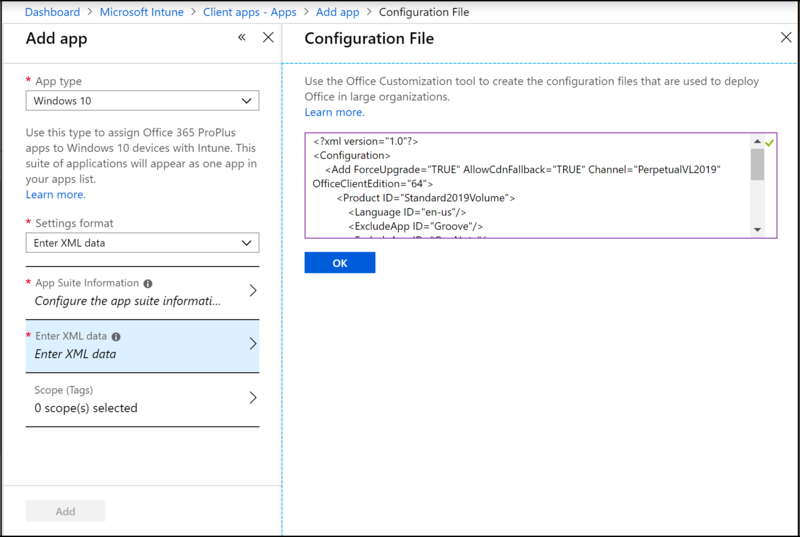 Intune supports adding Office apps from the Office 365 suite only. If any Office apps are open when Intune installs the app suite, the installation might fail, and users might lose data from unsaved files. This installation method is not supported on Windows 10 S, Windows Home, Windows Team, Windows Holographic, or Windows Holographic for Business devices. 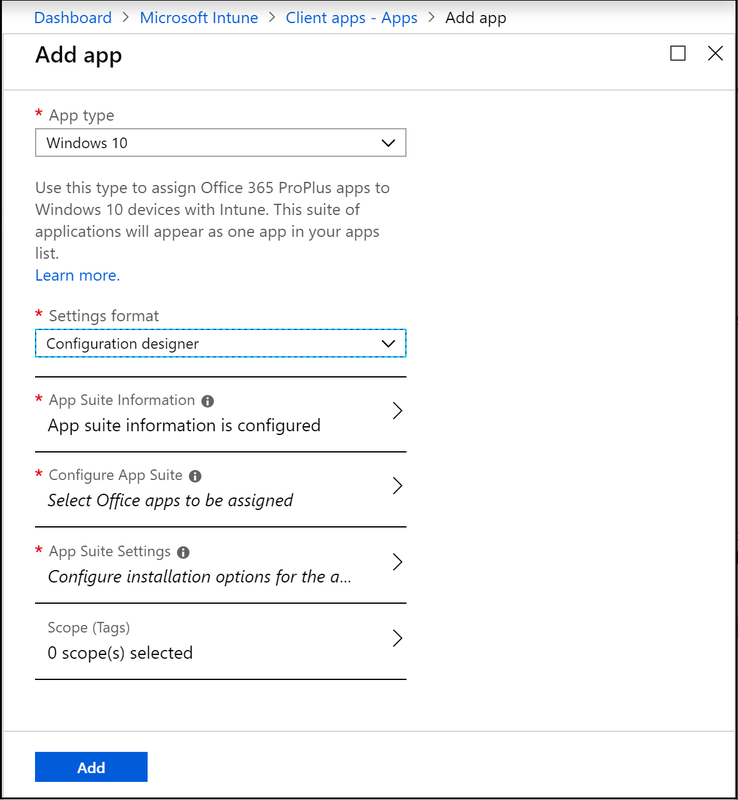 Intune does not support installing Office 365 desktop apps from the Microsoft Store (known as Office Centennial apps) on a device to which you have already deployed Office 365 apps with Intune. If you install this configuration, it might cause data loss or corruption. Multiple required or available app assignments are not additive. A later app assignment will overwrite pre-existing installed app assignments. For example, if the first set of Office apps contains Word, and the later one does not, Word will be uninstalled. This condition does not apply to any Visio or Project applications. Office version - Choose whether you want to assign the 32-bit or 64-bit version of Office. You can install the 32-bit version on both 32-bit and 64-bit devices, but you can install the 64-bit version on 64-bit devices only. Remove MSI from end-user devices - Choose whether you want to remove pre-existing Office .MSI apps from end-user devices. The installation won’t succeed if there are pre-existing .MSI apps on end-user devices. The apps to be uninstalled are not limited to the apps selected for installation in Configure App Suite, as it will remove all Office (MSI) apps from the end user device. For more information, see Remove existing MSI versions of Office when upgrading to Office 365 ProPlus. When Intune reinstalls Office on your end user's machines, end users will automatically get the same language packs that they had with previous .MSI Office installations. In the Add apps pane, in the App type list, under Office 365 Suite, select Windows 10. When you choose Enter XML data the Add app blade with display the Enter XML data option. Select this to display the Configuration File blade. For more information about the Enter XML data option, see Enter XML data below. In this step, you provide information about the app suite. This information helps you to identify the app suite in Intune, and it helps users to find the app suite in the company portal. In the Add App pane, select App Suite Information. Suite Name: Enter the name of the app suite as it is displayed in the company portal. Make sure that all suite names that you use are unique. If the same app suite name exists twice, only one of the apps is displayed to users in the company portal. Suite Description: Enter a description for the app suite. For example, you could list the apps you've selected to include. Publisher: Microsoft appears as the publisher. Category: Optionally, select one or more of the built-in app categories or a category that you created. This setting makes it easier for users to find the app suite when they browse the company portal. Developer: Microsoft appears as the developer. Owner: Microsoft appears as the owner. Logo: The Office 365 logo is displayed with the app when users browse the company portal. If you selected the Configuration designer option under the Setting format dropdown box, you'll see the Configure App Suite option in the Add app blade. Select the Office apps that you want to assign to devices. In the Add App pane, select Configure App Suite. In the Configure App Suite pane, select the standard Office apps that you want to assign to devices. Additionally, you can install apps for the Microsoft Project Online desktop client and Microsoft Visio Online Plan 2, if you own licenses for them. If you selected the Configuration designer option under the Setting format dropdown box, you'll see the App Suite Settings option in the Add app blade. In this step, configure installation options for the app suite. The settings apply to all apps that you added to the suite. In the Add App pane, select App Suite Settings. Office version: Choose whether you want to assign the 32-bit or 64-bit version of Office. You can install the 32-bit version on both 32-bit and 64-bit devices, but you can install the 64-bit version on 64-bit devices only. After you choose a channel, you can optionally select Specific to install a specific version of Office for the selected channel on end user devices. Then, select the Specific version of Office to use. The available versions will change over time. Therefore, when creating a new deployment, the versions available may be newer and not have certain older versions available. Current deployments will continue to deploy the older version, but the version list will be continually updated per channel. For devices that update their pinned version (or update any other properties) and are deployed as available, the reporting status will show as Installed if they installed the previous version until the device check-in occurs. When the device check-in happens, the status will temporarily change to Unknown, however it will not be shown to the user. When the user initiates the install for the newer available version, the user will see the status changed to Installed. For more information, see Overview of update channels for Office 365 ProPlus. Automatically accept the app end user license agreement: Select this option if you don't require end users to accept the license agreement. Intune then automatically accepts the agreement. Use shared computer activation: Select this option when multiple users share a computer. For more information, see Overview of shared computer activation for Office 365. Languages: Office is automatically installed in any of the supported languages that are installed with Windows on the end-user's device. Select this option if you want to install additional languages with the app suite. You can deploy additional languages for Office 365 Pro Plus apps managed through Intune. The list of available languages includes the Type of language pack (core, partial, and proofing). In the Azure portal, select Microsoft Intune > Client apps > Apps > Add. In the App type list of the Add app blade, select Windows 10 under Office 365 Suite. Select Languages in the App Suite Settings blade. For additional information, see Overview of deploying languages in Office 365 ProPlus. If you selected the Enter XML data option under the Setting format dropdown box, you'll see the Enter XML format option in the Add app blade. For more information, see Configuration options for the Office Deployment Tool. When you're done, in the Add App pane, select Add. The app you've created is displayed in the apps list. The following tables list common error codes you might encounter and their meaning. To assign the apps to the groups you choose, see Assign apps to groups.